For the ranking system, e.g. "four out of five stars", see Star (classification). Astronomy is a natural science that studies celestial objects and phenomena. It applies mathematics, physics, and chemistry in an effort to explain the origin of those objects and phenomena and their evolution. Objects of interest include planets, moons, stars, nebulae, galaxies, and comets; the phenomena also includes supernova explosions, gamma ray bursts, quasars, blazars, pulsars, and cosmic microwave background radiation. More generally, all phenomena that originate outside Earth's atmosphere are within the purview of astronomy. A related but distinct subject is physical cosmology, which is the study of the Universe as a whole. 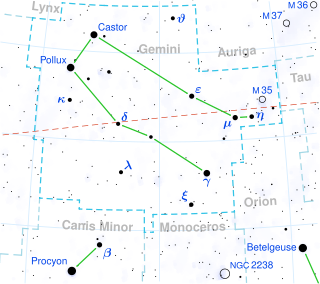 Most stars are currently classified under the Morgan-Keenan (MK) system using the letters O, B, A, F, G, K, and M, a sequence from the hottest (O type) to the coolest (M type). Each letter class is then subdivided using a numeric digit with 0 being hottest and 9 being coolest (e.g. 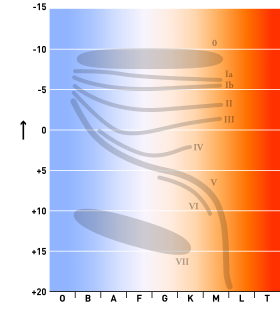 A8, A9, F0, and F1 form a sequence from hotter to cooler). The sequence has been expanded with classes for other stars and star-like objects that do not fit in the classical system, such as class D for white dwarfs and classes S and C for carbon stars. A carbon star is typically an asymptotic giant branch star, a luminous red giant, whose atmosphere contains more carbon than oxygen. The two elements combine in the upper layers of the star, forming carbon monoxide, which consumes all the oxygen in the atmosphere, leaving carbon atoms free to form other carbon compounds, giving the star a "sooty" atmosphere and a strikingly ruby red appearance. There are also some dwarf and supergiant carbon stars, with the more common giant stars sometimes being called classical carbon stars to distinguish them. In the MK system, a luminosity class is added to the spectral class using Roman numerals. This is based on the width of certain absorption lines in the star's spectrum, which vary with the density of the atmosphere and so distinguish giant stars from dwarfs. Luminosity class 0 or Ia+ is used for hypergiants, class I for supergiants, class II for bright giants, class III for regular giants, class IV for sub-giants, class V for main-sequence stars, class sd (or VI) for sub-dwarfs, and class D (or VII) for white dwarfs. The full spectral class for the Sun is then G2V, indicating a main-sequence star with a temperature around 5,800 K.
The conventional color description takes into account only the peak of the stellar spectrum. In actuality, however, stars radiate in all parts of the spectrum. Because all spectral colors combined appear white, the actual apparent colors the human eye would observe are far lighter than the conventional color descriptions would suggest. This characteristic of 'lightness' indicates that the simplified assignment of colors within the spectrum can be misleading. Excluding color-contrast illusions in dim light, there are no green, indigo, or violet stars. Red dwarfs are a deep shade of orange, and brown dwarfs do not literally appear brown, but hypothetically would appear dim grey to a nearby observer. A brown dwarf is a type of substellar object occupying the mass range between the heaviest gas giant planets and the lightest stars, having a mass between approximately 13 to 75–80 times that of Jupiter (MJ), or approximately 2.5×1028 kg to about 1.5×1029 kg. Below this range are the sub-brown dwarfs (sometimes referred to as rogue planets), and above it are the lightest red dwarfs (M9 V). 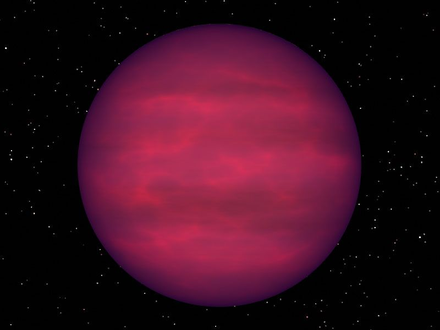 Brown dwarfs may be fully convective, with no layers or chemical differentiation by depth. The modern classification system is known as the Morgan–Keenan (MK) classification. Each star is assigned a spectral class from the older Harvard spectral classification and a luminosity class using Roman numerals as explained below, forming the star's spectral type. Other modern stellar classification systems, such as the UBV system, are based on color indexes—the measured differences in three or more color magnitudes. Those numbers are given labels such as "U-V" or "B-V", which represent the colors passed by two standard filters (e.g. Ultraviolet, Blue and Visual). In astronomy, a photometric system is a set of well-defined passbands, with a known sensitivity to incident radiation. The sensitivity usually depends on the optical system, detectors and filters used. For each photometric system a set of primary standard stars is provided. The UBV photometric system, also called the Johnson system, is a wide band photometric system for classifying stars according to their colors. It is the first known standardized photoelectric photometric system. The letters U, B, and V stand for ultraviolet, blue, and visual magnitudes, which are measured for a star then two subtractions are performed in a specific order to classify it in the system. In astronomy, the color index is a simple numerical expression that determines the color of an object, which in the case of a star gives its temperature. The smaller the color index, the more blue the object is. Conversely, the larger the color index, the more red the object is. This is a consequence of the logarithmic magnitude scale, in which brighter objects have smaller magnitudes than dimmer ones. For comparison, the yellowish Sun has a B−V index of 0.656 ± 0.005, whereas the bluish Rigel has a B−V of −0.03. Traditionally, the color index uses Vega as a zero point. The Harvard system is a one-dimensional classification scheme by astronomer Annie Jump Cannon, who re-ordered and simplified a prior alphabetical system. Stars are grouped according to their spectral characteristics by single letters of the alphabet, optionally with numeric subdivisions. Main-sequence stars vary in surface temperature from approximately 2,000 to 50,000 K, whereas more-evolved stars can have temperatures above 100,000 K. Physically, the classes indicate the temperature of the star's atmosphere and are normally listed from hottest to coldest. The Kelvin scale is an absolute thermodynamic temperature scale using as its null point absolute zero, the temperature at which all thermal motion ceases in the classical description of thermodynamics. The kelvin is the base unit of temperature in the International System of Units (SI). The Hertzsprung–Russell diagram relates stellar classification with absolute magnitude, luminosity, and surface temperature. Conventional color descriptions are traditional in astronomy, and represent colors relative to the mean color of an A class star, which is considered to be white. The apparent color  descriptions are what the observer would see if trying to describe the stars under a dark sky without aid to the eye, or with binoculars. However, most stars in the sky, except the brightest ones, appear white or bluish white to the unaided eye because they are too dim for color vision to work. Red supergiants are cooler and redder than dwarfs of the same spectral type, and stars with particular spectral features such as carbon stars may be far redder than any black body. Harvard astronomer Cecilia Payne then demonstrated that the O-B-A-F-G-K-M spectral sequence is actually a sequence in temperature. Because the classification sequence predates our understanding that it is a temperature sequence, the placement of a spectrum into a given subtype, such as B3 or A7, depends upon (largely subjective) estimates of the strengths of absorption features in stellar spectra. As a result, these subtypes are not evenly divided into any sort of mathematically representable intervals. Spectra for dwarfs (luminosity class V) for standard spectral types taken from Pickles (1998). Several notable spectral lines are indicated. Hydrogen lines are strongest for types A and B, and the overall spectrum peaks at shorter wavelengths for hotter stars. The Yerkes spectral classification, also called the MKK system from the authors' initials, is a system of stellar spectral classification introduced in 1943 by William Wilson Morgan, Philip C. Keenan, and Edith Kellman from Yerkes Observatory. This two-dimensional (temperature and luminosity) classification scheme is based on spectral lines sensitive to stellar temperature and surface gravity, which is related to luminosity (whilst the Harvard classification is based on just surface temperature). Later, in 1953, after some revisions of list of standard stars and classification criteria, the scheme was named the Morgan–Keenan classification, or MK,  and this system remains in use. A slash (/) means that a star is either one class or the other. A dash (-) means that the star is in between the two classes. For example, a star classified as A3-4III/IV would be in between spectral types A3 and A4, while being either a giant star or a subgiant. Sub-dwarf classes have also been used: VI for sub-dwarfs (stars slightly less luminous than the main sequence). Nominal luminosity class VII (and sometimes higher numerals) is now rarely used for white dwarf or "hot sub-dwarf" classes, since the temperature-letters of the main sequence and giant stars no longer apply to white dwarfs. For example, 59 Cygni is listed as spectral type B1.5Vnne,  indicating a spectrum with the general classification B1.5V, as well as very broad absorption lines and certain emission lines. The reason for the odd arrangement of letters in the Harvard classification is historical, having evolved from the earlier Secchi classes and been progressively modified as understanding improved. Secchi class I White and blue stars with broad heavy hydrogen lines, such as Vega and Altair. This includes the modern class A and early class F.
Secchi class II Yellow stars – hydrogen less strong, but evident metallic lines, such as the Sun, Arcturus, and Capella. This includes the modern classes G and K as well as late class F.
Secchi class III Orange to red stars with complex band spectra, such as Betelgeuse and Antares. 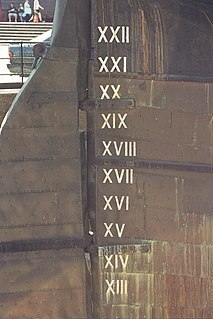 This corresponds to the modern class M.
Red stars with significant carbon bands and lines, corresponding to modern classes C and S.
The Roman numerals used for Secchi classes should not be confused with the completely unrelated Roman numerals used for Yerkes luminosity classes. I A, B, C, D Hydrogen lines dominant. IV N Did not appear in the catalogue. V O Included Wolf–Rayet spectra with bright lines. Classes carried through into the MK system are in bold. In the 1880s, the astronomer Edward C. Pickering began to make a survey of stellar spectra at the Harvard College Observatory, using the objective-prism method. A first result of this work was the Draper Catalogue of Stellar Spectra, published in 1890. Williamina Fleming classified most of the spectra in this catalogue. In 1901, Annie Jump Cannon returned to the lettered types, but dropped all letters except O, B, A, F, G, K, M, and N used in that order, as well as P for planetary nebulae and Q for some peculiar spectra. She also used types such as B5A for stars halfway between types B and A, F2G for stars one-fifth of the way from F to G, and so on. Finally, by 1912, Cannon had changed the types B, A, B5A, F2G, etc. to B0, A0, B5, F2, etc. This is essentially the modern form of the Harvard classification system. Stars are often referred to as early or late types. "Early" is a synonym for hotter, while "late" is a synonym for cooler. Depending on the context, "early" and "late" may be absolute or relative terms. "Early" as an absolute term would therefore refer to O or B, and possibly A stars. As a relative reference it relates to stars hotter than others, such as "early K" being perhaps K0, K1, and K3. "Late" is used in the same way, with an unqualified use of the term indicating stars with spectral types such as K and M, but it can also be used for stars that are cool relative to other stars, as in using "late G" to refer to G7, G8, and G9. In the relative sense, "early" means a lower Arabic numeral following the class letter, and "late" means a higher number. This obscure terminology is a hold-over from an early 20th century model of stellar evolution, which supposed that stars were powered by gravitational contraction via the Kelvin–Helmholtz mechanism, which is now known to not apply to main sequence stars. If that were true, then stars would start their lives as very hot "early-type" stars and then gradually cool down into "late-type" stars. This mechanism provided ages of the Sun that were much smaller than what is observed in the geologic record, and was rendered obsolete by the discovery that stars are powered by nuclear fusion. The terms "early" and "late" were carried over, beyond the demise of the model they were based on. The spectrum of an O5v star. O-type stars are very hot and extremely luminous, with most of their radiated output in the ultraviolet range. These are the rarest of all main-sequence stars. About 1 in 3,000,000 (0.00003%) of the main-sequence stars in the solar neighborhood are O-type stars. [nb 5]  Some of the most massive stars lie within this spectral class. O-type stars frequently have complicated surroundings that make measurement of their spectra difficult. O-type stars have dominant lines of absorption and sometimes emission for He II lines, prominent ionized (Si IV, O III, N III, and C III) and neutral helium lines, strengthening from O5 to O9, and prominent hydrogen Balmer lines, although not as strong as in later types. Because they are so massive, O-type stars have very hot cores and burn through their hydrogen fuel very quickly, so they are the first stars to leave the main sequence. B-type stars are very luminous and blue. Their spectra have neutral helium lines, which are most prominent at the B2 subclass, and moderate hydrogen lines. As O- and B-type stars are so energetic, they only live for a relatively short time. Thus, due to the low probability of kinematic interaction during their lifetime, they are unable to stray far from the area in which they formed, apart from runaway stars. Massive yet non-supergiant entities known as "Be stars" are main-sequence stars that notably have, or had at some time, one or more Balmer lines in emission, with the hydrogen-related electromagnetic radiation series projected out by the stars being of particular interest. Be stars are generally thought to feature unusually strong stellar winds, high surface temperatures, and significant attrition of stellar mass as the objects rotate at a curiously rapid rate. Objects known as "B(e)" or "B[e]" stars possess distinctive neutral or low ionisation emission lines that are considered to have 'forbidden mechanisms', undergoing processes not normally allowed under current understandings of quantum mechanics. Class A Vega (left) compared to the Sun (right). "G star" redirects here. For other uses, see G star (disambiguation). G is host to the "Yellow Evolutionary Void". Supergiant stars often swing between O or B (blue) and K or M (red). While they do this, they do not stay for long in the yellow supergiant G class, as this is an extremely unstable place for a supergiant to be. "K-type star" redirects here. For the Korean nuclear fusion project, see KSTAR. K-type stars are orangish stars that are slightly cooler than the Sun. They make up about 12% of the main-sequence stars in the solar neighborhood. [nb 5]  There are also giant K-type stars, which range from hypergiants like RW Cephei, to giants and supergiants, such as Arcturus, whereas orange dwarfs, like Alpha Centauri B, are main-sequence stars. Class M stars are by far the most common. About 76% of the main-sequence stars in the solar neighborhood are class M stars. [nb 5] [nb 6]  However, class M main-sequence stars (red dwarfs) have such low luminosities that none are bright enough to be seen with the unaided eye, unless under exceptional conditions. The brightest known M-class main-sequence star is M0V Lacaille 8760, with magnitude 6.6 (the limiting magnitude for typical naked-eye visibility under good conditions is typically quoted as 6.5), and it is extremely unlikely that any brighter examples will be found. Although most class M stars are red dwarfs, most of the largest ever supergiant stars in the Milky Way are M stars, such as VV Cephei, Antares and Betelgeuse, which are also class M. Furthermore, the larger, hotter brown dwarfs are late class M, usually in the range of M6.5 to M9.5. The spectrum of a class M star contains lines from oxide molecules (in the visible spectrum, especially TiO) and all neutral metals, but absorption lines of hydrogen are usually absent. TiO bands can be strong in class M stars, usually dominating their visible spectrum by about M5. Vanadium(II) oxide bands become present by late M.
Spectra of some very hot and bluish stars exhibit marked emission lines from carbon or nitrogen, or sometimes oxygen. WNE (WN2 to WN5 with some WN6) – hotter or "early"
WNL (WN7 to WN9 with some WN6) – cooler or "late"
WCE (WC4 to WC6) – hotter or "early"
WCL (WC7 to WC9) – cooler or "late"
Although the central stars of most planetary nebulae (CSPNe) show O type spectra,  around 10% are hydrogen-deficient and show WR spectra. These are low-mass stars and to distinguish them from the massive Wolf-Rayet stars, their spectra are enclosed in square brackets: e.g. [WC]. Most of these show [WC] spectra, some [WO], and very rarely [WN]. The slash stars are O-type stars with WN-like lines in their spectra. The name "slash" comes from their printed spectral type having a slash in it (e.g. "Of/WNL"  ). Due to low surface gravity in giant stars, TiO- and VO-bearing condensates never form. Thus, L-type stars larger than dwarfs can never form in an isolated environment. However, it may be possible for these L-type supergiants to form through stellar collisions, an example of which is V838 Monocerotis while in the height of its luminous red nova eruption. Classes T and L could be more common than all the other classes combined if recent research is accurate. 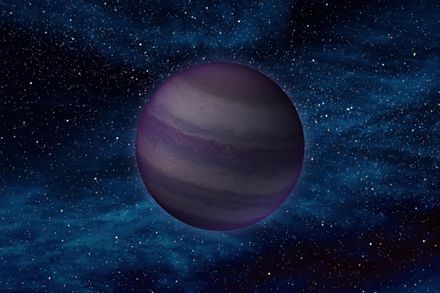 Because brown dwarfs persist for so long—a few times the age of the universe—in the absence of catastrophic collisions these smaller bodies can only increase in number. Study of the number of proplyds (protoplanetary disks, clumps of gas in nebulae from which stars and planetary systems are formed) indicates that the number of stars in the galaxy should be several orders of magnitude higher than what was previously conjectured. It is theorized that these proplyds are in a race with each other. The first one to form will become a protostar, which are very violent objects and will disrupt other proplyds in the vicinity, stripping them of their gas. The victim proplyds will then probably go on to become main-sequence stars or brown dwarfs of the L and T classes, which are quite invisible to us. Carbon-stars are stars whose spectra indicate production of carbon—a byproduct of triple-alpha helium fusion. With increased carbon abundance, and some parallel s-process heavy element production, the spectra of these stars become increasingly deviant from the usual late spectral classes G, K, and M. Equivalent classes for carbon-rich stars are S and C.
The giants among those stars are presumed to produce this carbon themselves, but some stars in this class are double stars, whose odd atmosphere is suspected of having been transferred from a companion that is now a white dwarf, when the companion was a carbon-star. C-R – Formerly its own class (R) representing the carbon star equivalent of late G to early K-type stars. C-N – Formerly its own class representing the carbon star equivalent of late K to M-type stars. C-J – A subtype of cool C stars with a high content of 13C. C-H – Population II analogues of the C-R stars. C-Hd – Hydrogen-deficient carbon stars, similar to late G supergiants with CH and C2 bands added. Class S stars form a continuum between class M stars and carbon stars. Those most similar to class M stars have strong ZrO absorption bands analogous to the TiO bands of class M stars, whereas those most similar to carbon stars have strong sodium D lines and weak C2 bands. Class S stars have excess amounts of zirconium and other elements produced by the s-process, and have more similar carbon and oxygen abundances than class M or carbon stars. Like carbon stars, nearly all known class S stars are asymptotic-giant-branch stars. The spectral type is formed by the letter S and a number between zero and ten. This number corresponds to the temperature of the star and approximately follows the temperature scale used for class M giants. The most common types are S3 to S5. The non-standard designation S10 has only been used for the star Chi Cygni when at an extreme minimum. White dwarfs come into an entirely different place near the bottom of the Hertzsprung-Russell diagram. The basic classification is usually followed by an abundance indication, following one of several schemes: S2,5; S2/5; S2 Zr4 Ti2; or S2*5. A number following a comma is a scale between 1 and 9 based on the ratio of ZrO and TiO. A number following a slash is a more recent but less common scheme designed to represent the ratio of carbon to oxygen on a scale of 1 to 10, where a 0 would be an MS star. Intensities of zirconium and titanium may be indicated explicitly. Also occasionally seen is a number following an asterisk, which represents the strength of the ZrO bands on a scale from 1 to 5. In between the M and S classes, border cases are named MS stars. In a similar way, border cases between the S and C-N classes are named SC or CS. The sequence M → MS → S → SC → C-N is hypothesized to be a sequence of increased carbon abundance with age for carbon stars in the asymptotic giant branch. The class D (for Degenerate) is the modern classification used for white dwarfs – low-mass stars that are no longer undergoing nuclear fusion and have shrunk to planetary size, slowly cooling down. Class D is further divided into spectral types DA, DB, DC, DO, DQ, DX, and DZ. The letters are not related to the letters used in the classification of other stars, but instead indicate the composition of the white dwarf's visible outer layer or atmosphere. DA – a hydrogen-rich atmosphere or outer layer, indicated by strong Balmer hydrogen spectral lines. DB – a helium-rich atmosphere, indicated by neutral helium, He I, spectral lines. DO – a helium-rich atmosphere, indicated by ionized helium, He II, spectral lines. DQ – a carbon-rich atmosphere, indicated by atomic or molecular carbon lines. DZ – a metal-rich atmosphere, indicated by metal spectral lines (a merger of the obsolete white dwarf spectral types, DG, DK and DM). DC – no strong spectral lines indicating one of the above categories. DX – spectral lines are insufficiently clear to classify into one of the above categories. DAB – a hydrogen- and helium-rich white dwarf displaying neutral helium lines. DAO – a hydrogen- and helium-rich white dwarf displaying ionized helium lines. DAZ – a hydrogen-rich metallic white dwarf. DBZ – a helium-rich metallic white dwarf. Finally, the classes P and Q, left over from the Draper system by Cannon, are occasionally used for certain non-stellar objects. Type P objects are stars within planetary nebulae and type Q objects are novae. Stellar remnants are objects associated with the death of stars. Included in the category are white dwarfs, and as can be seen from the radically different classification scheme for class D, non-stellar objects are difficult to fit into the MK system. Several spectral types, all previously used for non-standard stars in the mid-20th century, have been replaced during revisions of the stellar classification system. They may still be found in old editions of star catalogs: R and N have been subsumed into the new C class as C-R and C-N. Humans may eventually be able to colonize any kind of stellar habitat, this section will address the probability of life arising around other stars. Stability, luminosity, and lifespan are all factors in stellar habitability. We only know of one star that hosts life, and that is our own; a G class star with an abundance of heavy elements and low variability in brightness. It is also unlike many stellar systems in that it only has one star in it (see Planetary habitability, under the binary systems section). Working from these constraints and the problems of having an empirical sample set of only one, the range of stars that are predicted to be able to support life as we know it is limited by a few factors. Of the main-sequence star types, stars more massive than 1.5 times that of the Sun (spectral types O, B, and A) age too quickly for advanced life to develop (using Earth as a guideline). On the other extreme, dwarfs of less than half the mass of our Sun (spectral type M) are likely to tidally lock planets within their habitable zone, along with other problems (see Habitability of red dwarf systems). While there are many problems facing life on red dwarfs, due to their sheer numbers and longevity many astronomers continue to model these systems. ↑ This is the relative color of the star if Vega, generally considered a bluish star, is used as a standard for "white". ↑ Chromaticity can vary significantly within a class; for example, the Sun (a G2 star) is white, while a G9 star is yellow. ↑ Technically, white dwarfs are no longer “live” stars, but rather the “dead” remains of extinguished stars. Their classification uses a different set of spectral types from element-burning “live” stars. 1 2 3 4 5 6 7 These proportions are fractions of stars brighter than absolute magnitude 16; lowering this limit will render earlier types even rarer, whereas generally adding only to the M class. Supergiants are among the most massive and most luminous stars. Supergiant stars occupy the top region of the Hertzsprung–Russell diagram with absolute visual magnitudes between about −3 and −8. The temperature range of supergiant stars spans from about 3,450 K to over 20,000 K.
Red supergiants are stars with a supergiant luminosity class of spectral type K or M. They are the largest stars in the universe in terms of volume, although they are not the most massive or luminous. Betelgeuse and Antares are the brightest and best known red supergiants (RSGs), indeed the only first magnitude red supergiant stars. In astronomy, a blue giant is a hot star with a luminosity class of III (giant) or II. In the standard Hertzsprung–Russell diagram, these stars lie above and to the right of the main sequence. A giant star is a star with substantially larger radius and luminosity than a main-sequence star of the same surface temperature. They lie above the main sequence on the Hertzsprung–Russell diagram and correspond to luminosity classes II and III. The terms giant and dwarf were coined for stars of quite different luminosity despite similar temperature or spectral type by Ejnar Hertzsprung about 1905. A subdwarf, sometimes denoted by "sd", is a star with luminosity class VI under the Yerkes spectral classification system. They are defined as stars with luminosity 1.5 to 2 magnitudes lower than that of main-sequence stars of the same spectral type. On a Hertzsprung–Russell diagram subdwarfs appear to lie below the main sequence. A subgiant is a star that is brighter than a normal main-sequence star of the same spectral class, but not as bright as true giant stars. The term subgiant is applied both to a particular spectral luminosity class and to a stage in the evolution of a star. RV Tauri variables are luminous variable stars that have distinctive light variations with alternating deep and shallow minima. A yellow hypergiant is a massive star with an extended atmosphere, a spectral class from A to K, and, starting with an initial mass of about 20–60 solar masses, has lost as much as half that mass. They are amongst the most visually luminous stars, with absolute magnitude (MV) around −9, but also one of the rarest with just 15 known in the Milky Way and six of those in just a single cluster. They are sometimes referred to as cool hypergiants in comparison to O- and B-type stars, and sometimes as warm hypergiants in comparison to red supergiants. An O-type main-sequence star is a main-sequence star of spectral type O and luminosity class V. These stars have between 15 and 90 times the mass of the Sun and surface temperatures between 30,000 and 50,000 K. They are between 40,000 and 1,000,000 times as luminous as the Sun. A yellow supergiant star is a star, generally of spectral type F or G, having a supergiant luminosity class. They are stars that have evolved away from the main sequence, expanding and becoming more luminous. SU Andromedae is a carbon star in the constellation of Andromeda. It is a variable star classified as a slow irregular pulsating supergiant, and varies from an apparent visual magnitude of 8.5 at minimum brightness to a magnitude of 8.0 at maximum brightness with no clear period. HD 5980 is a multiple star system in NGC 346 in the Small Magellanic Cloud (SMC) and is one of the brightest stars in the SMC. Melnick 42 is a massive blue supergiant star in the Tarantula Nebula in the Large Magellanic Cloud located in the constellation Dorado. Although it is only 21 times the size of the sun, its high temperature of 47,300 K makes it one of the most luminous stars of the Tarantula Nebula at 3,600,000 L☉. It is less than two parsecs from the centre of the R136 cluster, although that is well outside the central core. WR 25 is a binary star system in the turbulent star forming region Carina Nebula, about 7,500 light-years from Earth. It contains a Wolf-Rayet star and a hot luminous companion, and is a member of the Trumpler 16 cluster. WR 24 is a Wolf-Rayet star in the constellation Carina. It is one of the most luminous stars known. 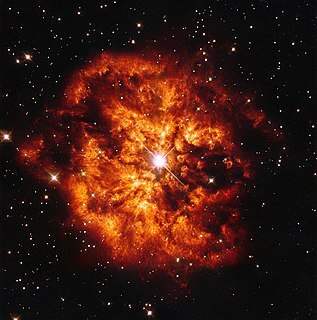 At the edge of naked eye visibility it is also one of the brightest Wolf Rayet stars in the sky. An O-type star is a hot, blue-white star of spectral type O in the Yerkes classification system employed by astronomers. They have temperatures in excess of 30,000 kelvins (K). Stars of this type have strong absorption lines of ionised helium, strong lines of other ionised elements, and hydrogen and neutral helium lines weaker than spectral type B. 3 Geminorum is a blue supergiant star in the constellation Gemini. It is a small amplitude pulsating variable and a close double star, with a mean combined apparent visual magnitude of 5.75. 1 2 3 4 Habets, G. M. H. J.; Heinze, J. R. W. (November 1981). "Empirical bolometric corrections for the main-sequence". Astronomy and Astrophysics Supplement Series. 46: 193–237 (Tables VII and VIII). Bibcode:1981A&AS...46..193H. – Luminosities are derived from Mbol figures, using Mbol(☉)=4.75. ↑ Weidner, Carsten; Vink, Jorick S. (December 2010). "The masses, and the mass discrepancy of O-type stars". Astronomy and Astrophysics. 524. A98. arXiv: 1010.2204 . Bibcode:2010A&A...524A..98W. doi:10.1051/0004-6361/201014491. 1 2 Charity, Mitchell. "What color are the stars?". Vendian.org. Retrieved 13 May 2006. ↑ "The Colour of Stars". Australia Telescope National Facility. 2018-10-17. 1 2 Moore, Patrick (1992). The Guinness Book of Astronomy: Facts & Feats (4th ed.). Guinness. ISBN 978-0-85112-940-2. ↑ "The Colour of Stars". Australia Telescope Outreach and Education. 21 December 2004. Retrieved 26 September 2007. — Explains the reason for the difference in color perception. 1 2 3 4 Baraffe, I.; Chabrier, G.; Barman, T. S.; Allard, F.; Hauschildt, P. H. (May 2003). "Evolutionary models for cool brown dwarfs and extrasolar giant planets. The case of HD 209458". Astronomy and Astrophysics. 402 (2): 701–712. arXiv: astro-ph/0302293 . Bibcode:2003A&A...402..701B. doi:10.1051/0004-6361:20030252. 1 2 3 4 5 6 7 8 Ledrew, Glenn (February 2001). "The Real Starry Sky". Journal of the Royal Astronomical Society of Canada. 95: 32. Bibcode:2001JRASC..95...32L. ↑ Sota, A.; Maíz Apellániz, J.; Morrell, N. I.; Barbá, R. H.; Walborn, N. R.; et al. (March 2014). "The Galactic O-Star Spectroscopic Survey (GOSSS). II. Bright Southern Stars". The Astrophysical Journal Supplement Series. 211 (1). 10. arXiv: 1312.6222 . Bibcode:2014ApJS..211...10S. doi:10.1088/0067-0049/211/1/10. 1 2 Phillips, Kenneth J. H. (1995). Guide to the Sun. Cambridge University Press. pp. 47–53. ISBN 978-0-521-39788-9. ↑ Russell, Henry Norris (March 1914). "Relations Between the Spectra and Other Characteristics of the Stars". Popular Astronomy. Vol. 22. pp. 275–294. Bibcode:1914PA.....22..275R. ↑ Saha, M. N. (May 1921). "On a Physical Theory of Stellar Spectra". Proceedings of the Royal Society of London. Series A. 99 (697): 135–153. Bibcode:1921RSPSA..99..135S. doi:10.1098/rspa.1921.0029. ↑ Payne, Cecilia Helena (1925). Stellar Atmospheres; a Contribution to the Observational Study of High Temperature in the Reversing Layers of Stars (Ph.D). Radcliffe College. Bibcode:1925PhDT.........1P. ↑ Pickles, A. J. (July 1998). "A Stellar Spectral Flux Library: 1150-25000 Å". Publications of the Astronomical Society of the Pacific . 110 (749): 863–878. Bibcode:1998PASP..110..863P. doi:10.1086/316197. ↑ Morgan, William Wilson; Keenan, Philip Childs; Kellman, Edith (1943). An atlas of stellar spectra, with an outline of spectral classification. The University of Chicago Press. Bibcode:1943assw.book.....M. OCLC 1806249. ↑ Morgan, William Wilson; Keenan, Philip Childs (1973). "Spectral Classification". Annual Review of Astronomy and Astrophysics. 11: 29–50. Bibcode:1973ARA&A..11...29M. doi:10.1146/annurev.aa.11.090173.000333. 1 2 3 4 "A note on the spectral atlas and spectral classification". Centre de données astronomiques de Strasbourg . Retrieved 2 January 2015. ↑ Caballero-Nieves, S. M.; Nelan, E. P.; Gies, D. R.; Wallace, D. J.; DeGioia-Eastwood, K.; et al. (February 2014). "A High Angular Resolution Survey of Massive Stars in Cygnus OB2: Results from the Hubble Space Telescope Fine Guidance Sensors". The Astronomical Journal. 147 (2). 40. arXiv: 1311.5087 . Bibcode:2014AJ....147...40C. doi:10.1088/0004-6256/147/2/40. ↑ Prinja, R. K.; Massa, D. L. (October 2010). "Signature of wide-spread clumping in B supergiant winds". Astronomy and Astrophysics. 521. L55. arXiv: 1007.2744 . Bibcode:2010A&A...521L..55P. doi:10.1051/0004-6361/201015252. ↑ Gray, David F. (November 2010). "Photospheric Variations of the Supergiant γ Cyg". The Astronomical Journal. 140 (5): 1329–1336. Bibcode:2010AJ....140.1329G. doi:10.1088/0004-6256/140/5/1329. 1 2 Nazé, Y. (November 2009). "Hot stars observed by XMM-Newton. I. The catalog and the properties of OB stars". Astronomy and Astrophysics. 506 (2): 1055–1064. arXiv: 0908.1461 . Bibcode:2009A&A...506.1055N. doi:10.1051/0004-6361/200912659. ↑ Lyubimkov, Leonid S.; Lambert, David L.; Rostopchin, Sergey I.; Rachkovskaya, Tamara M.; Poklad, Dmitry B. (February 2010). "Accurate fundamental parameters for A-, F- and G-type Supergiants in the solar neighbourhood". Monthly Notices of the Royal Astronomical Society. 402 (2): 1369–1379. arXiv: 0911.1335 . Bibcode:2010MNRAS.402.1369L. doi:10.1111/j.1365-2966.2009.15979.x. ↑ Gray, R. O.; Corbally, C. J.; Garrison, R. F.; McFadden, M. T.; Robinson, P. E. (October 2003). "Contributions to the Nearby Stars (NStars) Project: Spectroscopy of Stars Earlier than M0 within 40 Parsecs: The Northern Sample. I". The Astronomical Journal. 126 (4): 2048–2059. arXiv: astro-ph/0308182 . Bibcode:2003AJ....126.2048G. doi:10.1086/378365. ↑ Shenavrin, V. I.; Taranova, O. G.; Nadzhip, A. E. (January 2011). "Search for and study of hot circumstellar dust envelopes". Astronomy Reports. 55 (1): 31–81. Bibcode:2011ARep...55...31S. doi:10.1134/S1063772911010070. ↑ Cenarro, A. J.; Peletier, R. F.; Sanchez-Blazquez, P.; Selam, S. O.; Toloba, E.; Cardiel, N.; Falcon-Barroso, J.; Gorgas, J.; Jimenez-Vicente, J.; Vazdekis, A. (January 2007). "Medium-resolution Isaac Newton Telescope library of empirical spectra - II. The stellar atmospheric parameters". Monthly Notices of the Royal Astronomical Society. 374 (2): 664–690. arXiv: astro-ph/0611618 . Bibcode:2007MNRAS.374..664C. doi:10.1111/j.1365-2966.2006.11196.x. ↑ Sion, Edward M.; Holberg, J. B.; Oswalt, Terry D.; McCook, George P.; Wasatonic, Richard (December 2009). "The White Dwarfs Within 20 Parsecs of the Sun: Kinematics and Statistics". The Astronomical Journal . 138 (6): 1681–1689. arXiv: 0910.1288 . Bibcode:2009AJ....138.1681S. doi:10.1088/0004-6256/138/6/1681. ↑ Smith, Myron A.; et al. (2011). "An Encoding System to Represent Stellar Spectral Classes in Archival Databases and Catalogs". arXiv: 1112.3617 [astro-ph.SR]. ↑ Arias, Julia I.; et al. (August 2016). "Spectral Classification and Properties of the OVz Stars in the Galactic O Star Spectroscopic Survey (GOSSS)". The Astronomical Journal. 152 (2): 31. arXiv: 1604.03842 . Bibcode:2016AJ....152...31A. doi:10.3847/0004-6256/152/2/31. ↑ MacRobert, Alan (1 August 2006). "The Spectral Types of Stars". Sky & Telescope. 1 2 3 4 5 6 7 8 9 10 11 Allen, J. S. "The Classification of Stellar Spectra". UCL Department of Physics and Astronomy: Astrophysics Group. Retrieved 1 January 2014. 1 2 Maíz Apellániz, J.; Walborn, Nolan R.; Morrell, N. I.; Niemela, V. S.; Nelan, E. P. (2007). "Pismis 24-1: The Stellar Upper Mass Limit Preserved". The Astrophysical Journal. 660 (2): 1480–1485. arXiv: astro-ph/0612012 . Bibcode:2007ApJ...660.1480M. doi:10.1086/513098. 1 2 Fariña, Cecilia; Bosch, Guillermo L.; Morrell, Nidia I.; Barbá, Rodolfo H.; Walborn, Nolan R. (2009). "Spectroscopic Study of the N159/N160 Complex in the Large Magellanic Cloud". The Astronomical Journal. 138 (2): 510–516. arXiv: 0907.1033 . Bibcode:2009AJ....138..510F. doi:10.1088/0004-6256/138/2/510. ↑ Rauw, G.; Manfroid, J.; Gosset, E.; Nazé, Y.; Sana, H.; De Becker, M.; Foellmi, C.; Moffat, A. F. J. (2007). "Early-type stars in the core of the young open cluster Westerlund 2". Astronomy and Astrophysics. 463 (3): 981–991. arXiv: astro-ph/0612622 . Bibcode:2007A&A...463..981R. doi:10.1051/0004-6361:20066495. 1 2 3 4 5 6 7 Crowther, Paul A. (2007). "Physical Properties of Wolf-Rayet Stars". Annual Review of Astronomy & Astrophysics. 45 (1): 177–219. arXiv: astro-ph/0610356 . Bibcode:2007ARA&A..45..177C. doi:10.1146/annurev.astro.45.051806.110615. ↑ Rountree Lesh, J. (1968). "The Kinematics of the Gould Belt: An Expanding Group?". The Astrophysical Journal Supplement Series. 17: 371. Bibcode:1968ApJS...17..371L. doi:10.1086/190179. ↑ Analyse spectrale de la lumière de quelques étoiles, et nouvelles observations sur les taches solaires, P. Secchi, Comptes Rendus des Séances de l'Académie des Sciences63 (July–December 1866), pp. 364–368. ↑ Nouvelles recherches sur l'analyse spectrale de la lumière des étoiles, P. Secchi, Comptes Rendus des Séances de l'Académie des Sciences63 (July–December 1866), pp. 621–628. ↑ Hearnshaw, J. B. (1986). The Analysis of Starlight: One Hundred and Fifty Years of Astronomical Spectroscopy. Cambridge, UK: Cambridge University Press. pp. 60, 134. ISBN 978-0-521-25548-6. ↑ Kaler, James B. (1997). Stars and Their Spectra: An Introduction to the Spectral Sequence. Cambridge: Cambridge University Press. pp. 62–63. ISBN 978-0-521-58570-5. ↑ p. 60–63, Hearnshaw 1986; pp. 623–625, Secchi 1866. ↑ Catchers of the Light: The Forgotten Lives of the Men and Women Who First Photographed the Heavens by Stefan Hughes. 1 2 Pickering, Edward C. (1890). "The Draper Catalogue of stellar spectra photographed with the 8-inch Bache telescope as a part of the Henry Draper memorial". Annals of Harvard College Observatory. 27: 1. Bibcode:1890AnHar..27....1P. 1 2 pp. 106–108, Hearnshaw 1986. ↑ pp. 111–112, Hearnshaw 1986. ↑ Maury, Antonia C.; Pickering, Edward C. (1897). "Spectra of bright stars photographed with the 11 inch Draper Telescope as part of the Henry Draper Memorial". Annals of Harvard College Observatory. 28: 1. Bibcode:1897AnHar..28....1M. ↑ Cannon, Annie J.; Pickering, Edward C. (1901). "Spectra of bright southern stars photographed with the 13 inch Boyden telescope as part of the Henry Draper Memorial". Annals of Harvard College Observatory. 28: 129. Bibcode:1901AnHar..28..129C. ↑ pp. 117–119, Hearnshaw 1986. ↑ Cannon, Annie Jump; Pickering, Edward Charles (1912). "Classification of 1,688 southern stars by means of their spectra". Annals of the Astronomical Observatory of Harvard College. 56 (5): 115. Bibcode:1912AnHar..56..115C. ↑ pp. 121–122, Hearnshaw 1986. ↑ "SPECTRAL CLASSIFICATION OF STARS". www.eudesign.com. Retrieved 2019-04-06. ↑ Nassau, J. J.; Seyfert, Carl K. (March 1946). "Spectra of BD Stars Within Five Degrees of the North Pole". Astrophysical Journal. 103: 117. Bibcode:1946ApJ...103..117N. doi:10.1086/144796. ↑ FitzGerald, M. Pim (October 1969). "Comparison Between Spectral-Luminosity Classes on the Mount Wilson and Morgan-Keenan Systems of Classification". Journal of the Royal Astronomical Society of Canada. 63: 251. Bibcode:1969JRASC..63..251P. ↑ Sandage, A. (December 1969). "New subdwarfs. II. Radial velocities, photometry, and preliminary space motions for 112 stars with large proper motion". Astrophysical Journal. 158: 1115. Bibcode:1969ApJ...158.1115S. doi:10.1086/150271. ↑ Norris, Jackson M.; Wright, Jason T.; Wade, Richard A.; Mahadevan, Suvrath; Gettel, Sara (December 2011). "Non-detection of the Putative Substellar Companion to HD 149382". The Astrophysical Journal. 743 (1). 88. arXiv: 1110.1384 . Bibcode:2011ApJ...743...88N. doi:10.1088/0004-637X/743/1/88. 1 2 3 4 5 6 7 8 Garrison, R. F. (1994). "A Hierarchy of Standards for the MK Process". Astronomical Society of the Pacific . 60: 3. Bibcode:1994ASPC...60....3G. ↑ Darling, David. "late-type star". The Internet Encyclopedia of Science. Retrieved 14 October 2007. 1 2 3 4 5 Walborn, N. R. (2008). "Multiwavelength Systematics of OB Spectra". Massive Stars: Fundamental Parameters and Circumstellar Interactions (Eds. P. Benaglia. 33: 5. Bibcode:2008RMxAC..33....5W. ↑ Walborn, N. R. (1971). "Some Spectroscopic Characteristics of the OB Stars: An Investigation of the Space Distribution of Certain OB Stars and the Reference Frame of the Classification". The Astrophysical Journal Supplement Series. 23: 257. Bibcode:1971ApJS...23..257W. doi:10.1086/190239. ↑ Morgan, W. W.; Abt, Helmut A.; Tapscott, J. W. (1978). "Revised MK Spectral Atlas for stars earlier than the sun". Williams Bay: Yerkes Observatory. Bibcode:1978rmsa.book.....M.
↑ Walborn, Nolan R.; Howarth, Ian D.; Lennon, Daniel J.; Massey, Philip; Oey, M. S.; Moffat, Anthony F. J.; Skalkowski, Gwen; Morrell, Nidia I.; Drissen, Laurent; Parker, Joel Wm. (2002). "A New Spectral Classification System for the Earliest O Stars: Definition of Type O2". The Astronomical Journal. 123 (5): 2754–2771. Bibcode:2002AJ....123.2754W. doi:10.1086/339831. ↑ Slettebak, Arne (July 1988). "The Be Stars". Publications of the Astronomical Society of the Pacific . 100: 770–784. Bibcode:1988PASP..100..770S. doi:10.1086/132234. ↑ "SIMBAD Object query : CCDM J02319+8915". SIMBAD . Centre de Données astronomiques de Strasbourg. Retrieved 10 June 2010. ↑ Nieuwenhuijzen, H.; De Jager, C. (2000). "Checking the yellow evolutionary void. Three evolutionary critical Hypergiants: HD 33579, HR 8752 & IRC +10420". Astronomy and Astrophysics. 353: 163. Bibcode:2000A&A...353..163N. ↑ "On a cosmological timescale, The Earth's period of habitability is nearly over | International Space Fellowship". Spacefellowship.com. Retrieved 22 May 2012. ↑ "Galactic refurbishment". www.spacetelescope.org. ESA/Hubble. Retrieved 29 April 2015. ↑ Figer, Donald F.; McLean, Ian S.; Najarro, Francisco (1997). "AK‐Band Spectral Atlas of Wolf‐Rayet Stars". The Astrophysical Journal. 486 (1): 420–434. Bibcode:1997ApJ...486..420F. doi:10.1086/304488. ↑ Kingsburgh, R. L.; Barlow, M. J.; Storey, P. J. (1995). "Properties of the WO Wolf-Rayet stars". Astronomy and Astrophysics. 295: 75. Bibcode:1995A&A...295...75K. ↑ Tinkler, C. M.; Lamers, H. J. G. L. M. (2002). "Mass-loss rates of H-rich central stars of planetary nebulae as distance indicators?". Astronomy and Astrophysics. 384 (3): 987–998. Bibcode:2002A&A...384..987T. doi:10.1051/0004-6361:20020061. ↑ Miszalski, B.; Crowther, P. A.; De Marco, O.; Köppen, J.; Moffat, A. F. J.; Acker, A.; Hillwig, T. C. (2012). "IC 4663: The first unambiguous [WN] Wolf-Rayet central star of a planetary nebula". Monthly Notices of the Royal Astronomical Society. 423 (1): 934–947. arXiv: 1203.3303 . Bibcode:2012MNRAS.423..934M. doi:10.1111/j.1365-2966.2012.20929.x. ↑ Crowther, P. A.; Walborn, N. R. (2011). "Spectral classification of O2-3.5 If*/WN5-7 stars". Monthly Notices of the Royal Astronomical Society. 416 (2): 1311–1323. arXiv: 1105.4757 . Bibcode:2011MNRAS.416.1311C. doi:10.1111/j.1365-2966.2011.19129.x. ↑ Kirkpatrick, J. D. (2008). "Outstanding Issues in Our Understanding of L, T, and Y Dwarfs". 14th Cambridge Workshop on Cool Stars. 384: 85. arXiv: 0704.1522 . Bibcode:2008ASPC..384...85K. 1 2 Kirkpatrick, J. Davy; Reid, I. Neill; Liebert, James; Cutri, Roc M.; Nelson, Brant; Beichman, Charles A.; Dahn, Conard C.; Monet, David G.; Gizis, John E.; Skrutskie, Michael F. (10 July 1999). "Dwarfs Cooler than M: the Definition of Spectral Type L Using Discovery from the 2-µ ALL-SKY Survey (2MASS)". The Astrophysical Journal. 519 (2): 802–833. Bibcode:1999ApJ...519..802K. doi:10.1086/307414. 1 2 Kirkpatrick, J. Davy (2005). "New Spectral Types L and T". Annual Review of Astronomy and Astrophysics . 43 (1): 195–246. Bibcode:2005ARA&A..43..195K. doi:10.1146/annurev.astro.42.053102.134017. ↑ Kirkpatrick, J. Davy; Barman, Travis S.; Burgasser, Adam J.; McGovern, Mark R.; McLean, Ian S.; Tinney, Christopher G.; Lowrance, Patrick J. (2006). "Discovery of a Very Young Field L Dwarf, 2MASS J01415823−4633574". The Astrophysical Journal. 639 (2): 1120–1128. arXiv: astro-ph/0511462 . Bibcode:2006ApJ...639.1120K. doi:10.1086/499622. ↑ Kirkpatrick, J. Davy; Cushing, Michael C.; Gelino, Christopher R.; Beichman, Charles A.; Tinney, C. G.; Faherty, Jacqueline K.; Schneider, Adam; Mace, Gregory N. (2013). "Discovery of the Y1 Dwarf WISE J064723.23-623235.5". The Astrophysical Journal. 776 (2): 128. arXiv: 1308.5372 . Bibcode:2013ApJ...776..128K. doi:10.1088/0004-637X/776/2/128. 1 2 Wehner, Mike (24 August 2011). "NASA spots chilled-out stars cooler than the human body | Technology News Blog – Yahoo! News Canada". Ca.news.yahoo.com. Retrieved 22 May 2012. ↑ Zuckerman, B.; Song, I. (2009). "The minimum Jeans mass, brown dwarf companion IMF, and predictions for detection of Y-type dwarfs". Astronomy and Astrophysics. 493 (3): 1149–1154. arXiv: 0811.0429 . Bibcode:2009A&A...493.1149Z. doi:10.1051/0004-6361:200810038. 1 2 3 Dupuy, T. J.; Kraus, A. L. (2013). "Distances, Luminosities, and Temperatures of the Coldest Known Substellar Objects". Science. 341 (6153): 1492–5. arXiv: 1309.1422 . Bibcode:2013Sci...341.1492D. doi:10.1126/science.1241917. PMID 24009359. 1 2 3 Leggett, S. K.; Cushing, Michael C.; Saumon, D.; Marley, M. S.; Roellig, T. L.; Warren, S. J.; Burningham, Ben; Jones, H. R. A.; Kirkpatrick, J. D.; Lodieu, N.; Lucas, P. W.; Mainzer, A. K.; Martín, E. L.; McCaughrean, M. J.; Pinfield, D. J.; Sloan, G. C.; Smart, R. L.; Tamura, M.; Van Cleve, J. (2009). "The Physical Properties of Four ∼600 K T Dwarfs". The Astrophysical Journal. 695 (2): 1517–1526. arXiv: 0901.4093 . Bibcode:2009ApJ...695.1517L. doi:10.1088/0004-637X/695/2/1517. ↑ Delorme, P.; Delfosse, X.; Albert, L.; Artigau, E.; Forveille, T.; Reylé, C.; Allard, F.; Homeier, D.; Robin, A. C.; Willott, C. J.; Liu, M. C.; Dupuy, T. J. (2008). "CFBDS J005910.90-011401.3: Reaching the T-Y brown dwarf transition?". Astronomy and Astrophysics. 482 (3): 961–971. arXiv: 0802.4387 . Bibcode:2008A&A...482..961D. doi:10.1051/0004-6361:20079317. ↑ Burningham, Ben; Pinfield, D. J.; Leggett, S. K.; Tamura, M.; Lucas, P. W.; Homeier, D.; Day-Jones, A.; Jones, H. R. A.; Clarke, J. R. A.; Ishii, M.; Kuzuhara, M.; Lodieu, N.; Zapatero Osorio, M. R.; Venemans, B. P.; Mortlock, D. J.; Barrado y Navascués, D.; Martin, E. L.; Magazzù, A. (2008). "Exploring the substellar temperature regime down to ∼550 K". Monthly Notices of the Royal Astronomical Society. 391 (1): 320–333. arXiv: 0806.0067 . Bibcode:2008MNRAS.391..320B. doi:10.1111/j.1365-2966.2008.13885.x. ↑ Luhman, Kevin L.; Esplin, Taran L. (May 2016). "The Spectral Energy Distribution of the Coldest Known Brown Dwarf". The Astronomical Journal. 152 (3): 78. arXiv: 1605.06655 . Bibcode:2016AJ....152...78L. doi:10.3847/0004-6256/152/3/78. 1 2 3 4 Sion, E. M.; Greenstein, J. L.; Landstreet, J. D.; Liebert, J.; Shipman, H. L.; Wegner, G. A. (1983). "A proposed new white dwarf spectral classification system". Astrophysical Journal. 269: 253. Bibcode:1983ApJ...269..253S. doi:10.1086/161036. ↑ Córsico, A. H.; Althaus, L. G. (2004). "The rate of period change in pulsating DB-white dwarf stars". Astronomy and Astrophysics. 428: 159–170. arXiv: astro-ph/0408237 . Bibcode:2004A&A...428..159C. doi:10.1051/0004-6361:20041372. ↑ McCook, George P.; Sion, Edward M. (1999). "A Catalog of Spectroscopically Identified White Dwarfs". The Astrophysical Journal Supplement Series. 121 (1): 1–130. Bibcode:1999ApJS..121....1M. CiteSeerX 10.1.1.565.5507 . doi:10.1086/313186. ↑ "Pulsating Variable Stars and the Hertzsprung-Russell (H-R) Diagram". Harvard-Smithsonian Center for Astrophysics. 9 March 2015. Retrieved 23 July 2016. Look up late-type star or early-type star in Wiktionary, the free dictionary. Merrifield, Michael; Bauer, Amanda; Häußler, Boris (2010). "Star Classification". Sixty Symbols. Brady Haran for the University of Nottingham.